Fete: Broad Oak Fire Fighters fete took place despite the rain last Sunday Thank to all those who turned out and braved the weather. £1,100 was taken on the day but more was coming in after the event. Brede Church did the efreshments and they were pleased with their takings too, well done to everyone involved. Sadly I missed it all as I was under the weather. Friday, August 3: Brede Farmers Market is from 10am – 12 noon in Brede Village Hall. If you are on holiday in the area do pop in and see what our local producers bring to the market. If you live locally also do the same, you will possibly be amazed at the diversity of goods available. Brede Short Mat Bowls at 7.30pm. Saturday, August 4: Tea, Cakes and CATS in Brede Village Hall at 8am. Open day at Old Broad Oak farm Business CentreTN31 6BX 10am – 4pm A chance to see what they all do and take advantage of promotions on the day. There is a 70’s Disco in Udimore Hall, pay at the door. Sunday 5 August Church Services in the Parish are as follows: Father Anthony White conducts the Mass at 9am in St Theresa’s Catholic Church on the old Northiam Road. If you need to contact the Father his number is 01424 773125 At St George’s Church, a sung Family Eucharist will be held at 9.30am Father Martin can be reached on 01424 883408. The Church’s Website is http:/www.stgeorgesbrede.org.uk other services held during the week is in the Church double issue Parish Magazine that is out now for August and September. The Trinity Methodist Church service will be taken by Local Arrangement today at 10.30am. The Reverend Peggy Heim is the Pastoral Minister and can be contacted on 01424 42235. The Brede Giants are open at the usual times of 10am - 4pm. Free parking and guided tours. Delicious home made cakes. Set your SATNAV to TN31 6HG and come and learn about the history of water supply. Learn more from our website www.bredesteamgiants.co.uk. Monday, August 6: Exercise Class 6.30pm in Udimore Community Hall The Rainbows have finished for the summer holidays, they meet from 4.15- 5.15pm, and they welcome girls aged between 5-7 years, Julie Piper can be contacted on 01424 883464 or mobile 07863 599537 The Brede Scout sections are all closed for the summer holidays and will return in September. They hold their meetings in the Scout Hut Stubbs Lane. You may still contact the leaders if you wish you child to join in September. If you would like your child to start please contact the Leaders of the section you wish to join. Beavers welcome girls and boys from 6 years old they meet from 5.15pm to 6.15pm. Contact Cherry Merricks 01424 251242 or 07761730956 or cherry.m@hotmail.com Cubs are 8-10½ years old and meet from 6.30 – 8.00pm. Contact Peter Clark 07702 407725 or famclark@hotmail.com There are vacancies for children and Leaders/Helpers The Scout Hut is disabled friendly and can be booked for parties or social events and camping in the grounds. It is available on all weekdays and Wednesday, Thursday and Friday evenings and the weekend. It is £6.00 per hour, there is a different price for camping. Please contact the booking clerk Rhiannon Oliver 01424 882037 The Whist players will be in action in Brede Village Hall at 7.30pm. Tuesday, August 7: Brede Painting for Pleasure is today at 9.30am in Brede Village Hall. Yoga will be in Brede Village Hall at 7.30pm Brede Scouts have finished now until September when they will meet, from 7pm – 9pm in the Scout Hut and any young person 10½ or over is welcome. Contact Luciano Frige on 0781 1339626 The Group Leader is Colin Ward and can be contacted on 07980 171877 or colinward3@sky.com if you would like your child to join any of the sections or help as a Leader or helper. Wednesday 8 August Yoga is in Brede Village Hall from 9.30am. Thursday, August 9: Brede Mother’s Union will be joining other Branches across East Sussex at St Peter’s in Bexhill for a service at 11am dedicated to Mary Sumner founder of Mother’s Union. Followed by a shared Picnic. Friday 10 August Brede Farmers Market in Brede Village Hall from 10am – 12noon. Future Events and Bookings Brede Painting for Pleasure Group hold their annual exhibition of work on the same weekend as Brede Flower Festival, so make this Bank Holiday an opportunity to smell the flowers and see the pictures. The exhibition is in Brede Village Hall, from 10am on Saturday, Sunday and Monday. Good parking and refreshments as well as a raffle opportunity to win original paintings. The hall is only fifteen minutes walk along Cackle Street or a two minute drive from the Church. 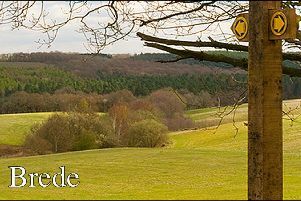 Bank holiday: Make Brede your destination of choice this coming August Bank Holiday. If you come on Bank Holiday Monday the Steam Giants are open too from 10am. You could have a wonderful time and spend the whole day in the Parish. Brede Flower Festival including all the side stalls and taking place on - Saturday 25 August Lipstick & Beatnics brilliant accomplished musicians will be entertaining at 7.30pm in St George’s Church. Tickets are £10 to include Paella and a glass of prosecco. Available from The Red Lion or Father Martin Tel 01424 883408 email martin.harper48@icloud.com Please let me know in good time if there is anything you would like put in the column.